X-Change the World has partnered with Africa Schoolhouse and GO Campaign to launch an initiative providing youth in developing countries with access to technology and training in computer literacy. GO Campaign helps X-Change the World vet local schools and NGOs and helps support the infrastructure needed for X-Change the World to facilitate the online cultural exchange between these students and their American peers. 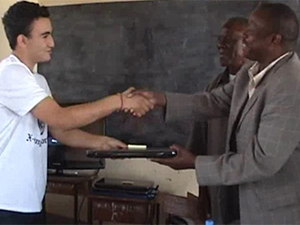 This summer, representatives from X-Change the World and GO Campaign traveled to Mwanza, Tanzania to provide laptop computers, solar panels, and a secure reliable internet connection to our new X-Change partner, Mwaniko Secondary School. The Deputy Secretary of State Office of the Vice President of Tanzania, Charles Grind, (pictured above) presided over the ceremony, lauding this initiative. In Tanzania, receiving a secondary school education which encompasses learning English is rare. Attending secondary school and engaging with American students in a virtual classroom is practically unheard of – until now. This opportunity gives Tanzanian youth conversational English skills, which places them at a far greater advantage in obtaining a well paying job, thus providing a financially secure future for themselves and their families. X-Change the World is honored to be recognized by Tanzania’s news media, and moreover is dedicated to continue our efforts in educating Tanzania’s youth, as we see opportunity for great prosperity there. This entry was posted in In The News by XChange. Bookmark the permalink.